In my heart, I know that the amount of mental energy and actual time I spend following professional baseball – more specifically, the San Francisco Giants – is preposterous. In Christopher Hitchens’ recent autobiography HITCH-22, he makes several typically withering asides about the hours of wasted life and squandered intellectual capital spent by some of his friends & associates watching soccer, or any other children’s game played by a team of highly-paid adults. I can’t say I disagree. I mean, I know people who have freed up a great deal more time in their lives for literature, music, family, film, exercise or what have you, simply by eschewing sports. I even went through a phase like that myself in the late 90s, when my beloved Giants made the ’97 playoffs, and I didn’t even watch a single game. I sure got a hell of a lot done that week – I was in grad school, getting married and doing a bunch of other very, very important things. 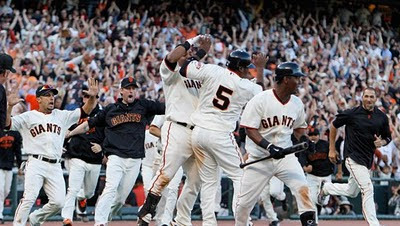 But when I moved back to San Francisco in 1999, my dormant sports mania went haywire again with the flip of a mental switch, just as it had most of my sentient life up to that point. There’s something screwy in our DNA that causes us to revere the most athletic of our tribe, and to take a collective interest in their accomplishments. We bizarrely reflect those accomplishments as somehow representative of the cities in which they are achieved. Of course I was raised to be a Giants, 49ers and Warriors fan. Those were my “home teams” (even though I grew up in Sacramento and San Jose). I clutch the 1978 Giants and the 1981 49ers to my figurative bosom very dearly – at the time, those teams and their races to first place were defining events, defining struggles, in my life to date. (Tough life, hunh?). I am proud that other than that brief period in the late 90s, I followed every San Francisco Giants box score each morning from 1977 up to the present day, along with somewhere between 50 and 100 radio or TV broadcasts per year. Mind you, this has been in some years with flat-out awful teams, which makes the very few good years – like 2010 – so psychically rewarding. But before I start frothing about the team, I want to get back to the absurdity of it all. For me, if I’m going to get into a sport or a team, it’s all in – or nothing. For instance, I jettisoned any interest whatsoever in football years ago – because it took up too much mental space from baseball. I don’t think I can name 5 guys in the NFL right now. Brett Favre? Yeah. Ladanian Tomlinson? I think so. That guy from the New York Giants who shot himself? Yeah, that guy. That’s about it. College sports, I couldn’t care less. Yet when the World Series is over, it will be hockey time. And NBA time. I’m in, all the way – blogs, websites, deep dissection of the daily sports page, podcasts, what have you. If I don’t know the minutiae of every player on my chosen teams – his stats, his playing time, how he did last game – I feel like I’m not doing my “job” as a sports fan, and I worry. And that’s just crazy talk, isn’t it? I marvel at the luxury of time that allows me to do this, and fret at what is being lost in my short time on the planet as I engage in this completely ridiculous man-child pursuit. Then again, let me admit that it is what it is. “I’m just as God made me”, as the “twisted old fruit” desk clerk says in This is Spinal Tap. That brings me to the San Francisco Giants. These are salad days for the long-suffering Giants fan. We have a totally “loveable” team, as much as athletes can be loveable, who are doing remarkable things, particularly on the pitcher’s mound. I don’t think there are two sports personalities I like in this world more than Tim Lincecum and Pablo Sandoval, despite “Pablo Strand-'em-all”’s propensity for inning-crushing double play balls. (For my guide to pro baseball players from a few months ago, click here). They are overachievers, cobbled together after years of miserable play by faded veterans (which still continues to this day), led by a 23-year-old catcher named Buster Posey, and with a just-barely-21 tobacco-spittin’ country boy pitcher named Madison Bumgarner getting a chance to start in the playoffs. No egomaniac jerk-offs like Barry Bonds, no clubhouse downers like Jeff Kent – and the one that we did have, a failed September experiment named Jose Guillen, was decidedly cast away by management for the duration of the playoffs under the guise of a faux “neck injury”. I love that they cut their losses that way, which has allowed an unlikely hero, the chrome-domed Cody Ross, to emerge this Fall. The Giants are one win away from the World Series, and they’ll have two chances to get it in Philadelphia this weekend. San Francisco and the greater Bay Area will go absolutely berserk if they do. Admit it, we’re a race of man- and woman-children, hardwired to be this way, and only the truly disciplined among us can overcome this faulty wiring in our DNA. I’ll tally up the lost days and missed opportunities on my deathbed – meanwhile, this is way too fun to miss right now.